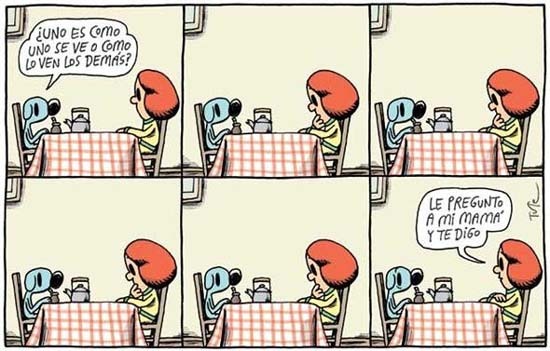 The two ways of seeing the mimosa reminded me of the question intriguing Batu, the protagonist of the daily comic strip Tute in the newspaper La Nación. This Metro Goldwyn Mayer short film about Buenos Aires in 1932 that I have just received from my mother is a further illustration of this essential question. Beyond the images that testify how the city looked at that time, the presentation is colored by the rather romantic and vague preconceptions of the filmmakers. Just like in the famous movie scene where Rodolfo Valentino is dancing tango dressed up as a gaucho and wearing a Spanish hat, here too the imageries of various people of Hispanic origin are intermixed, especially in the music. One could also object that the film shows only the nice aspects of the city and its people, while nothing is seen of the other, much more miserable and less pleasant reality of Argentina of the thirties, although it might seem exaggerated to demand so much social realism from a touristic and commercial film such as this. The Costanera Sur – Southern Riverside – at the start of the tour, which in the thirties was still a bathing place and where already there stood the impressive fountain sculpted by Lola Mora (in the last twenty years or so, after several years of neglect, nature took claim of the place and it has become an ecological reserve only some minutes away from the commercial district of the town). The monument of the Spaniards where Libertador and Sarmiento Avenues cross, in the midst of Palermo Woods, my favourite image of the city. “El Tigre,” a recreation spot that was very fashionable around the thirties and which has recently recovered part of its old splendour. Maybe the most curious thing for me was to see the Palermo Hippodrome as it is shown here. In one of its buildings, remodeled years ago with its bleachers now encased in glass, we had our wedding party. I must say, however, that I had never heard anything about that prohibition of being out on the street without a jacket. And then the other curiosities that have been lost, like the milk vendors leading their cows and the scarcely hygienic “pleasure” of drinking milk directly from the cow… Or the policemen acting as light signals and Calle Florida when it was not yet converted into a pedestrian street as we know it now. And what to say about that man, Benito, who colored the pigeons of Buenos Aires to make them merrier? Again the question whether for themselves or for the others? because I doubt if the pigeons felt merrier after the artistic intervention, even if perhaps they cheered those who looked at their new colors. By the end of the film we are absolutely convinced that Buenos Aires has always been a theater of all imaginable kind of madness. I like it how you connected the phrase of Tute with the way you re-saw your own city. The way you tell it, it does seem like Argentina is a country of madness. About the pigeons I must say I agree with you, I doubt they were merrier because they had had their color changed. But that´s not the point. Things like drinking milk directly from the cow are the one that really say something about Argentineans. I remember last year that I had my own buenos aires apartment I went to the outsides of BA and spent a whole day in a rural farm learning about animals and how to take care of them. I kind of liked it! I loved the video too, I donñt know if it shows the actual Argentina in 1932, but surely is fun! Y una fe de erratas. In my response to Μαριανα, where it says "true" I meant "TRUH", sorry! Y la publicidad no me importaría hasta que el/la lectorª hace esfuerzo de envolverla en una atenta y amable respuesta adecuada al post, ¿qué te parece? jajajaja, no te digo que soy el pariente idiota?